I think I&apos;ve watched Kemonozume episode 1 three times in total. 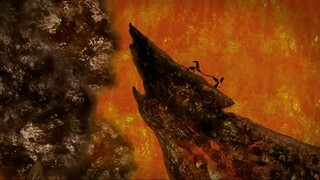 The prelude to the credits describes and event that took place in the ancient history of the show&apos;s world. An event that directly leads to the situation the characters find themselves in. Simple small shadows form the characters here, reminding me of the interstitial segments linking scenes in Jim Henson&apos;s Storyteller. After the credits we find ourselves in a club where 2 men are talking surrounded by aquariums. The fish in the aquariums look like digitally treated live footage. While this scene betrays the cheapness TV animation tends to possess, the dialogue and acting here are great. And the body language is well portrayed. One man (or monster) is revelling in his murder and eating of young women, the other is restrained, seemingly happy to live a hidden existance. The flesh eating monster chides his companion for not giving into these urges. However it turns out he has been set up. 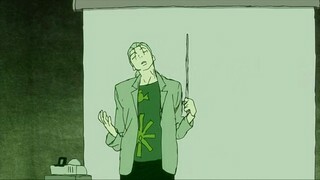 There then follows a lengthy talking heads scene that acts as both detail of the world the show takes place in and the relationships between Toshihiko, his father and adopted brother Kazuma. 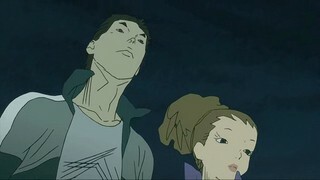 Here we seem to have themes of tradition vs. ambition introduced as Kazuma wishes to use high-tech means to eliminate all the Kemonozume (the monsters we met at the start), whereas his father seems to have other intentions in the fight with them other than to kill them (once an arm was removed he allowed the creature in the opening scene to flee). We then get a scene between Toshihiko and Rie walking on the beach. Old friends, a subtle scene where Rie tries holding his hand shows you all you need to know about their relationship. This is followed with a short montage showing various Kifuuken at work. Also a Monkey! Sheesh, that&apos;s only about half way through the episode. I shall rave on more about it tomorrow I think.